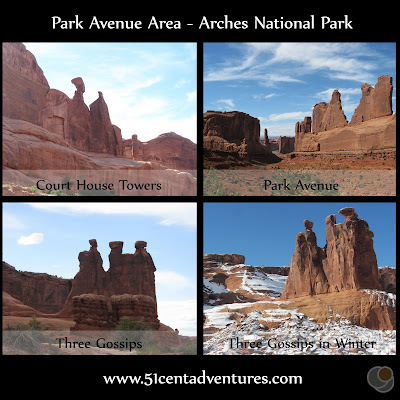 Description: As it's name suggests, Arches National Park is home to many stone arches. There are over 2000 sand stone arches in the park. World famous arches such as Delicate Arch, Landscape Arch, and Double Arch are found in the park. 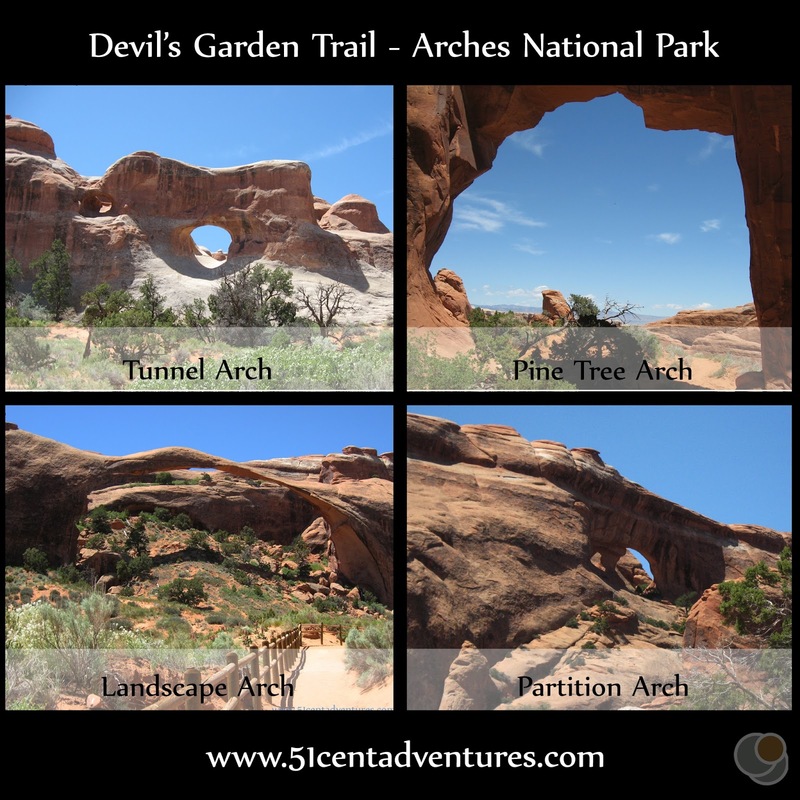 There are many hiking trails that range from easy to strenuous that will take you up close to the arches. Location: The park is located in the Southeastern part of Utah. The park is north of Moab, Utah. The park entrance is located just off of US Highway 191. The main features of the park are located within 10-20 miles from the entrance. This park's close proximity to the highway makes it an easy place to stop and visit - even if you are just passing through the area. Entrance to the park is included in the $80 National Parks Annual Pass or the $50 Southeast Utah Parks Annual Pass. Camping is $25 per night at the Devil's Canyon Campground. Operating Seasons and Hours: The park is open 24 hours a day all year long. The Visitor Center is generally open from 9:00 to 4:00 with longer hours in the summer. Date of Visit: Wednesday May 19, 2010 - Friday May 21, 2010. And Thursday, December 19, 2013. This was the fourth and final stop of the sixth day of the Southern Utah Road Trip that my husband and I went on for our third anniversary in May of 2010. We left Island in the Sky District of Canyonlands National Park and drove about 30 miles to the entrance of Arches National Park. We camped in the park the next two nights, and spent the days exploring the many trails inside the park. Arches National Park is one of my favorite places. It's not just one of my favorite places in Utah or one of my favorite places in the United States - it's one of my favorite places on Earth. So what makes Arches National Park so great? Well, mostly it's the arches. No where else on earth can you see that many natural arches in such a small area. 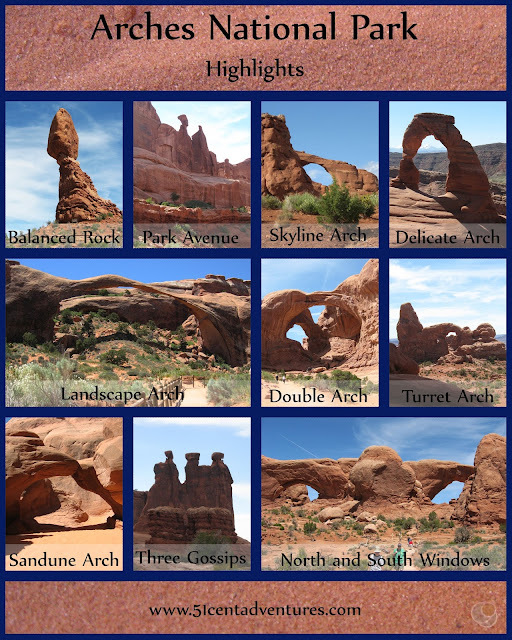 There are over 2000 sand stone arches in the park. Of those 2000 there are about 15-20 famous arches. Some arches are easy to get to, and others require some hiking. The landscape surrounding the arches is beautiful and almost magical. All the rocks are sand stone which has eroded away in places and left sand on the ground. In some ways the park feels like the inside of a giant sandbox. I think every family should visit this park while their children are young. In my mind Arches is the Disneyland of the National Parks. 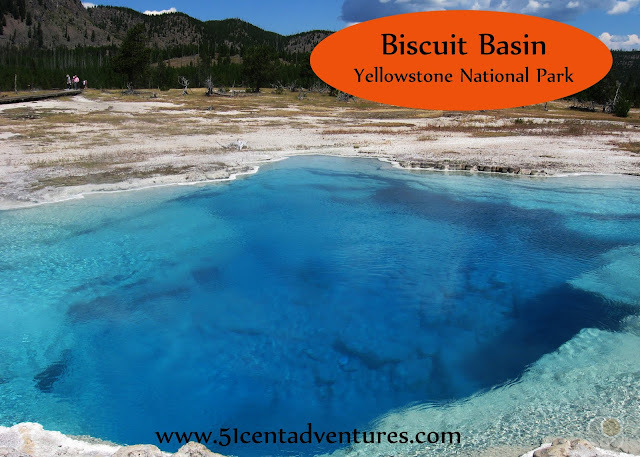 The park's size is relatively small compared to other national parks, but there is a lot to see and do in a small place. The park has features that are interesting both for adults and children. It's attractions are awe inspiring. This is a place that your whole family can have fun. Back in 1991, when I was six years old, my parents announced to me and my younger siblings that we'd go to Arches in the fall. My sisters and I were so excited. This would be our family's first big camping trip. We borrowed camping gear from my grandparents and headed down to Arches for the week. We camped in the Devil's Garden Campground. 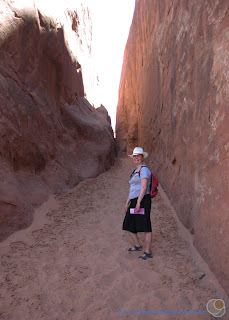 I spent countless hours sliding down the sandstone formation that was behind our campsite. We explored the park and even went on some short hikes as a family. 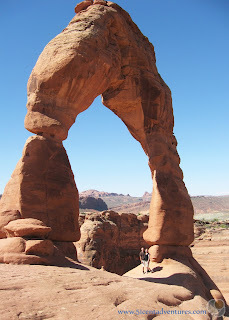 One day my dad took me on a hike to Delicate Arch. That hike was probably one of the hardest things I'd ever done in my short life, but it was worth it. Coincidentally, my husband was also visiting Arches with his family at pretty much the same time. We didn't know each other, but it's always kind of fun to imagine that we did see each other. Years later we had fun trading stories about our trips to Arches. I'd been back one time when I was a teenager, but my husband hadn't been back since the trip with his family. We spent a little over 36 hours in the park. You can spend a shorter or longer amount of time there, but 36 hours ended up being the perfect amount of time for us to see all the main parts of the park. I'm going to tell you a little about each of the major areas that you can visit. 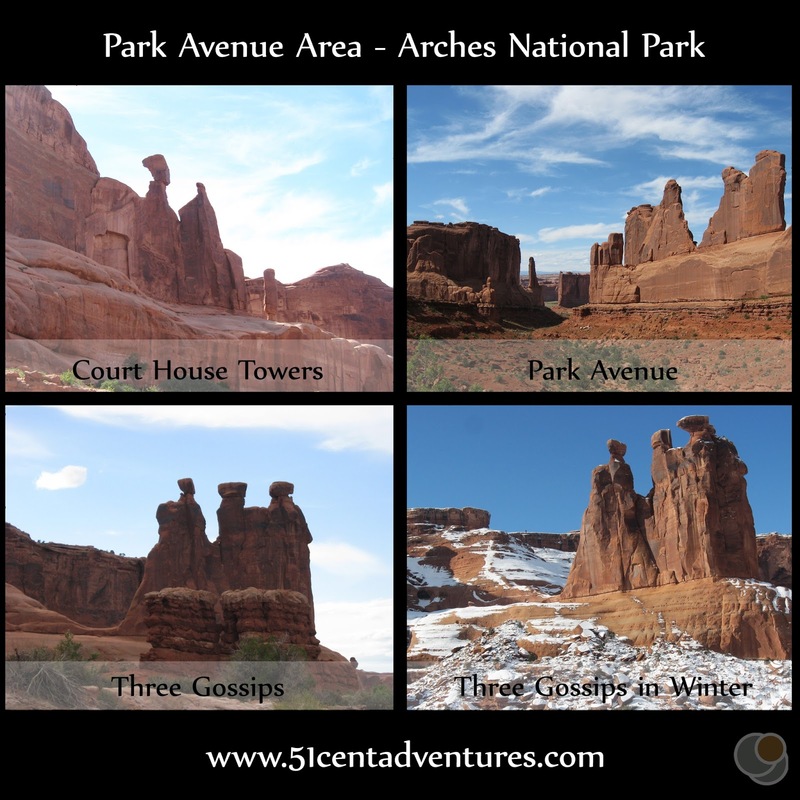 This is by no means a comprehensive guide to the park, but it should give you a good idea of what to expect from a trip to Arches. One little caveat before I get started: because we were there for so long and because Arches is one of my favorite places I took a lot of pictures. I've grouped them together by area so that this post doesn't get too cluttered with all the pictures. 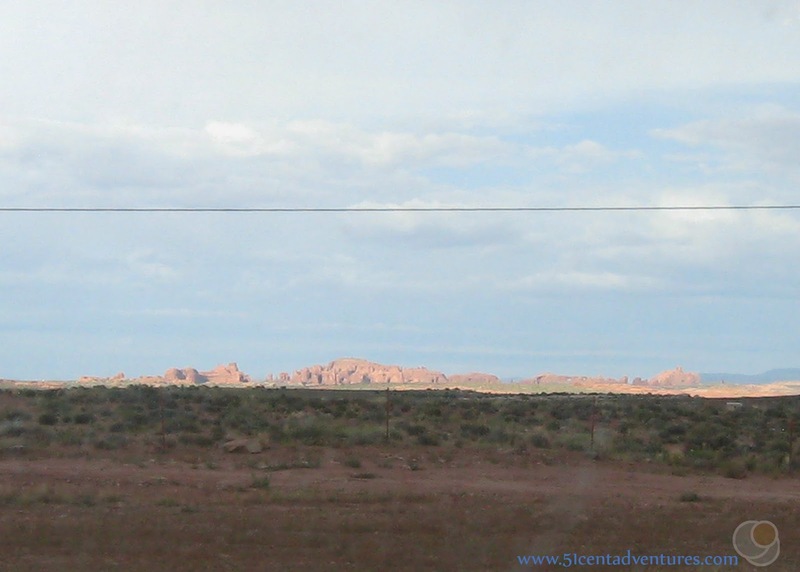 One of the nice things about Arches National Park is it's proximity to a major road. Highway 191 runs right next to the park. Unlike some of the other parks in Utah you don't have to spend a lot of time on back roads to reach the park. Once you go though the park's entrance station you will come to the Visitor Center. The Visitor Center has some nice interpretive displays about the park, a movie, and a gift shop. There are restrooms at the Visitor Center too. The restroom doors are located on the exterior of the building. That way you can use the facilities even if the main part of the building is closed. If you are short on time you can skip most of the things in the Visitor Center - you're here to see the real park not just read about it after all. But one thing you cannot skip is the water. Water is only available at the Visitor Center and the Devil's Garden Trail head. Plan accordingly. After you leave the Visitor Center you'll drive up a steep, and curvy road to access the rest of the park. This road scared me as a kid and it still scares me a little as an adult. The first area of interest inside the main part of the park is the Park Avenue area. The hike through Park Avenue is rated as moderate and is 2 miles round trip. You can walk down the trail and then walk back, or if you have a buddy, you can have them meet you with a car at the other end of the trail. On our trip we didn't do the Park Avenue hike. But we did pull over at the view point and check out the scenery. Everything in these four pictures is visible from the road. On our next trip I hope to have time for Park Avenue because my father in law says that this is his favorite part of the park. Next on the road is Balanced Rock. This feature is kind of in it's own little area. But it's so unique that it's worth a stop. There is a parking area and then a short trail takes you all the way around the rock. The Windows section is probably the easiest place to see arches. 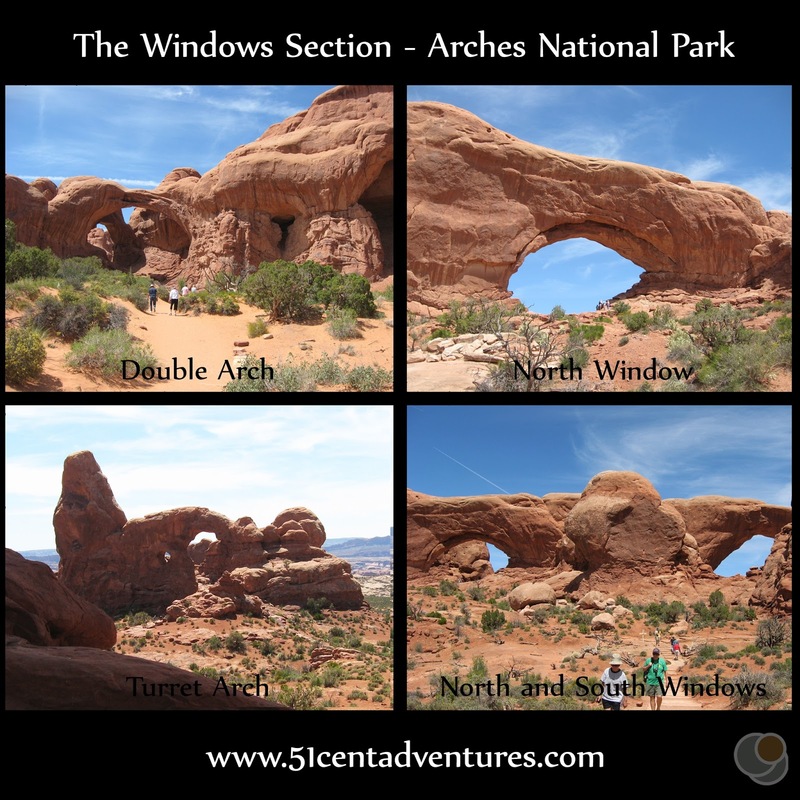 There are four major arches all within a short distance of each other. 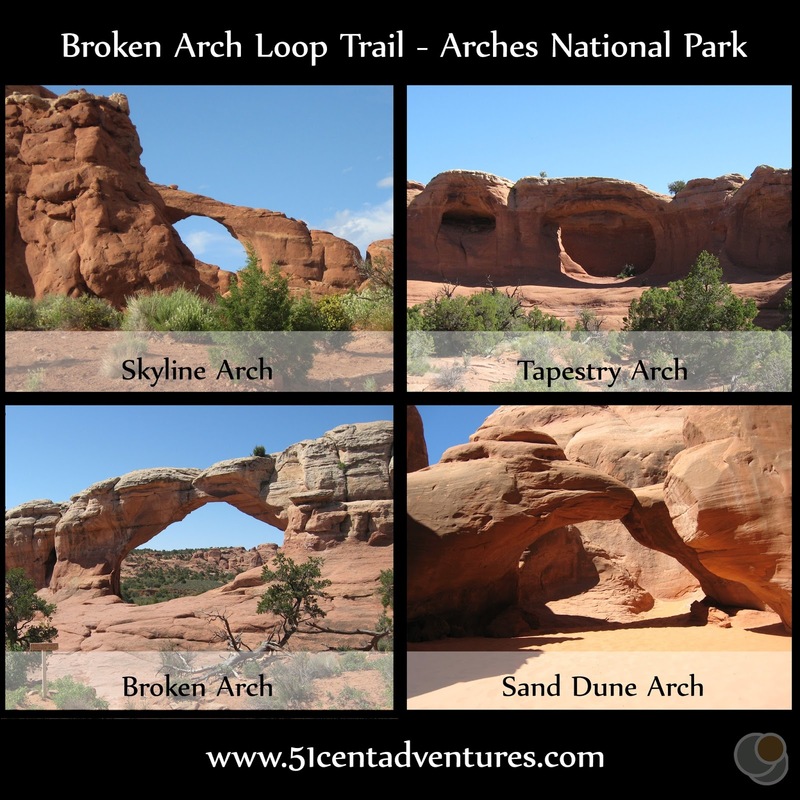 The trails to each arch are less than 1 mile long and rated as easy. You can park your car in the parking lot and then hike to each arch. The North and South Windows are each large arches that are fun to view. The trail is slightly steep, but the view is worth it at the end. Turret Arch is famous because of it's odd shape. 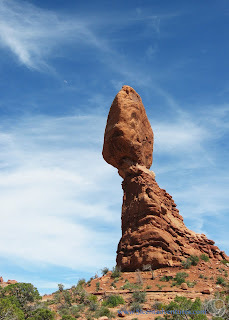 If you have time for only one hike then I suggest you hike to Delicate Arch. There is a view point that you can drive to, but you will be below the arch. The hike will take you right up next to the arch. The hike is three miles round trip and is rated as strenuous. As with most of the trails in the park there is little shade. This hike is not recommended during the day during hot summer months. It starts next to the Wolfe Ranch Cabin where the first (and pretty much only) setters of this area lived back in the 1800's. Then the trail climbs straight up slickrock. This part can be pretty rough. After the slick rock the trail levels out elevation wise - but the terrain is very rocky. The the trail goes around a large petrified sand dune and the trail becomes a ledge along a steep cliff on one side and a sandstone wall on the other. When I was a kid this part of the trail freaked me out. I was so scared I'd fall off the trail. As an adult it's not that bad at all. Finally the trail goes around the other side of the wall and you can see Delicate Arch. You can go right under the arch and take your picture. You can't climb any of the arches in the park so don't try to do that. This area of the park is accessible if you pay an extra fee for a guided tour or pay an extra fee for a permit. We didn't go here because, well, this blog is called 51 cent adventures for a reason. But I've heard great things about this area. It's basically a natural stone labyrinth. A permit costs $6 for an adult and $3 for a child. The cost for a guided tour is $16 for an adult or $8 for a child age 5-12. You can reserve a spot for a morning tour online. 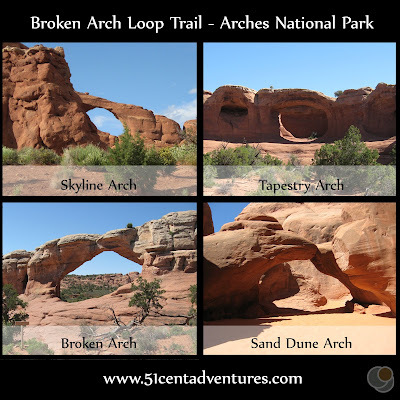 This is a good hike if you want to see lots of arches. 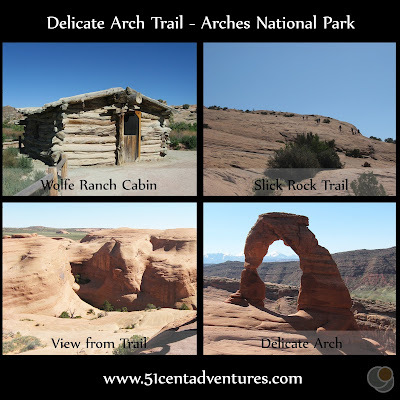 The trail to Landscape Arch is rated as easy and is only 1.6 miles round trip. After that the trail continues on in a 5 mile loop. The trail rating changes to strenuous. We only hiked to Landscape Arch, and it was an enjoyable hike. I want to hike the full trail one day. Landscape Arch is the longest arch in the park. My husband and I had heard rumors that Landscape Arch had completely fallen down. It hadn't, but back in 1991, just a few weeks after both of us came to Arches with our families, a huge slab had fallen. The thinnest point in the arch is only 6 feet thick, but it's still standing. Partition Arch is visible from the area around Landscape Arch. Further up, the trail loops around to pass close by Partition Arch. Tunnel Arch and Pine Tree Arch are visible with short side trips off the main trail. My husband remembered Pine Tree arch from when he was a kid. I didn't remember Pine Tree or Tunnel Arch, but I did remember parts of the trail. This sandy area stretches off of the trail about 50 feet from the trail head. My parents have home videos of my sister slowly crawling down this sandy hill. As we hiked down this trail we came up with one of the best vacation jokes ever. Over the past few days we'd visited a lot of Native American ruins. As we talked about those places we made up a parody of This Old House called "This Old Dwelling" Hosted by Bob Kiva. We imagined him showing off an old Pueblo that was being reconstructed by ancient Indians. Jokes include, "we used to live in this dwelling 50 years ago, but the herds moved on. Now they're back and so are we. We are trying to fix this place up. In the past 50 years we've learned some new construction techniques." The parody includes lots of sayings like, "this is going to cost a little bit for per square foot, but it will hold up for a lot longer" and other common This Old House sayings. We laughed the whole way down the trail. If Arches National Park has a flaw it's that it can get really crowded. Like insanely crowded. Parking lots are small to begin with and they fill up quickly. That's one reason we reserved two nights in the Devil's Garden Campground. 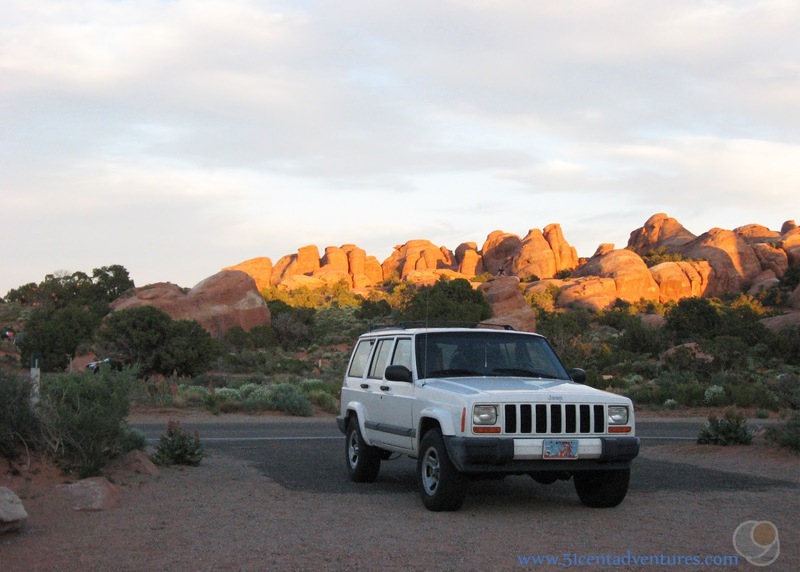 We were able to leave our jeep at our campsite and walk over to the Devil's Garden Trail. It was also nice to not have to drive in and out of the park each day. 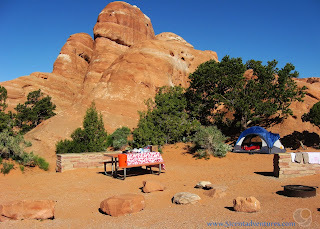 My family stayed at this campground when we visited Arches. Our campsite had a huge sandstone formation next to it. I spent hours climbing up the sandstone and sliding back down. I wore out a pair of shorts doing that. When I reserved our campsite for this trip I really wanted to stay at the same campsite. I spent quite a while studying the online campground map and the tiny JPEG pictures trying to find the exact same campground where my family stayed. I ended up picking campsite # 44. As soon as we pulled up I knew that it wasn't the one where my family stayed, but it was the one right next to it. My family had stayed at # 39. Later Iwent over to #39 and took pictures of the places where my sisters and I had played. Here's a picture of our campsite. We stayed here two nights which was the longest we stayed any one place on this vacation. It was nice to not have to pack up our tent in the morning. Here's a long shot of the campground. You can just barely make out our jeep and tent in the middle of the picture. We paid $20 a night to stay at the Devils Garden Campground. We had access to a bathroom with hot and cold running water and flushing toilets. We were also within walking distance of the Devil's Garden Trail and the Broken Arch Loop Trail. Honestly you could skip this trail and not miss anything. But it's listed on the park map and we visited so I might as well mention it. 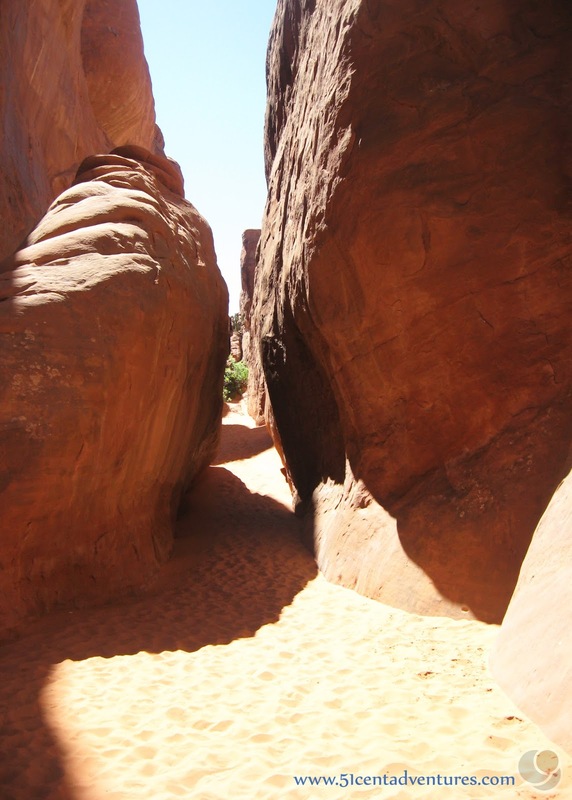 You can access the trail either from the Devil's Garden Campground (that's what we did) or you can access it from the Sand Dune Arch parking lot. The trail is 2 miles long and is flat the whole way. Skyline Arch is visible from the trail, but it's also visible from the main park road. I loved skyline arch as a kid so I was happy to see it again. Tapestry Arch is visible from the trail, and you can also walk over to it to get a closer look. Broken Arch isn't really broken, but it looks like it is. 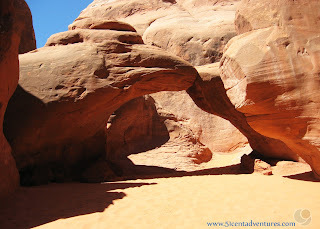 The trail finally takes you to the area where Sand Dune Arch is sheltered. 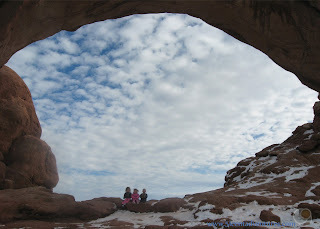 Sand Dune Arch is one of those places you should check out - especially if you have children. The whole area around the arch is shady and full of sand. When I was a kid it seems like my family came to this arch at least once a day to play in the sand and get out of the sun. My dad would dig deep holes and bury us up to our heads in them. Sand Dune Arch is sheltered inside of what seems to be a solid mass of sandstone. 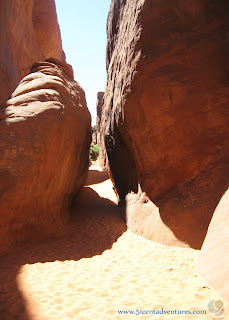 The trail to the arch takes you though a narrow slot through the rocks. The trail itself is hardly a tenth of a mile to the arch. Of all the places we visited on our Southern Utah Road Trip, Arches National Park is the only place we've been able to come back to visit. Back in December of 2013 we decided to try to do the 20 hour drive from Fort Hood, Texas to Salt Lake City, Utah without stopping overnight. It was a long drive and I'm not sure if I recommend travelling that long, but we were excited to be heading to our home state. 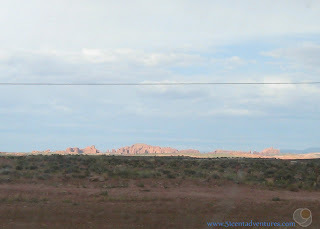 When we reached Monticello, Utah we knew that we needed a place to let the kids run around. 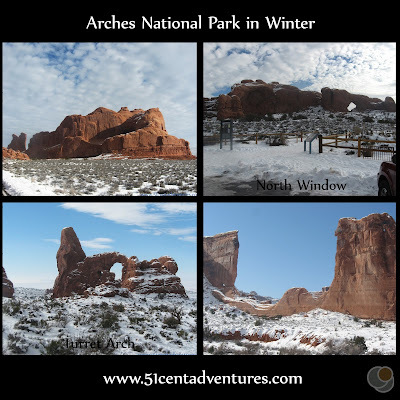 The best place I could think of was the Visitor Center for Arches. So the kids held on for one more hour and we made it to Arches. We let them run around in the visitor center for a while, and then took them on a hike to the North Window. The whole park was so pretty with snow. Recommendation: Everyone should visit Arches National Park at least once in their life. The arches are so unique and interesting. Each area of the park is worth a visit, but if you are up for it you should definitely hike to Delicate Arch. Directions: If you are travelling on Highway 191 you will pass right by the entrance to the park. The entrance is on the East side of the road. 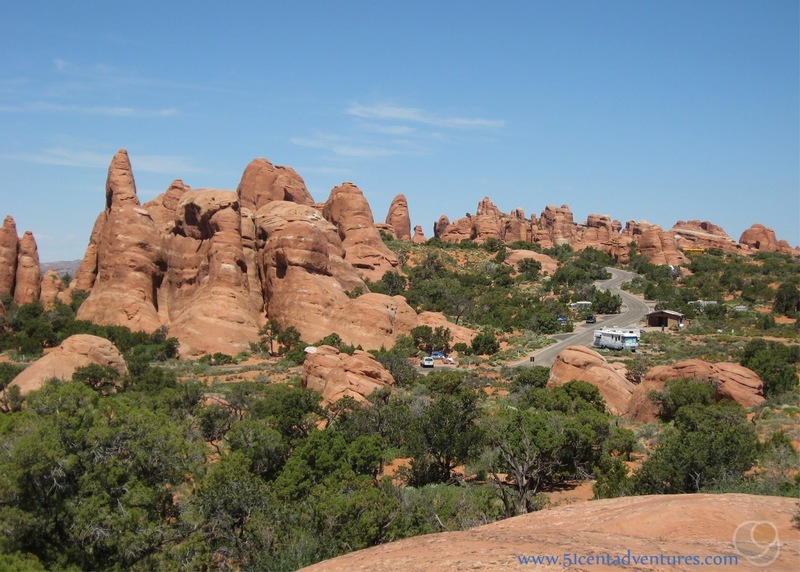 Most people will travel to Arches via I-70. The park is only 30 miles south of I-70. In fact, the park is visible from Highway 191. As you travel south on that road you'll pass the signs indicating the turn off for the road that leads to Dead Horse Point and the Island in the Sky District of Canyonlands. If you look to the East when you pass that sign you will see sandstone formations. Those are the formations that contain Arches National Park. If you look closely you can see the North and South Windows. And if you look really carefully, you might even spot Delicate Arch. Additional Information: You may be wondering how all these arches formed. The National Park Service published a great explanation. Follow this link to find out how the arches formed. 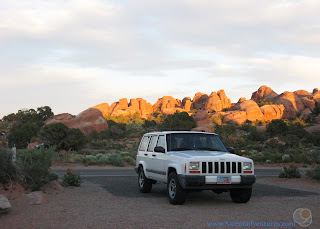 Places Nearby: I've talked a lot about many interesting things to see and do in the Moab area in my other posts. One place I haven't mentioned yet is the La Sal Mountains. These mountains are East of the park and are very noticeable at heights as high as 13,000 feet. Discover Moab has a lot of info about camping and driving in the La Sal Mountains. So go check that out. Love Arches! We keep thinking we need to stay at the Devil's Canyon Campground, but never think of it in enough advance to actually get a reservation.